1 A None No Power Seat 1 A is a standard Economy class seat that may have restricted legroom due to the position of the bulkhead. 1 B None No Power Seat 1 B is a standard Economy class seat that may have restricted legroom due to the position of the bulkhead. 1 C None No Power Seat 1 C is a standard Economy class seat that may have restricted legroom due to the position of the bulkhead. 1 D None No Power Seat 1 D is a standard Economy class seat that may have restricted legroom due to the position of the bulkhead. 1 E None No Power Seat 1 E is a standard Economy class seat that may have restricted legroom due to the position of the bulkhead. 1 F None No Power Seat 1 F is a standard Economy class seat that may have restricted legroom due to the position of the bulkhead. 12 A None No Power Seat 12 A is a standard Economy class seat that has extra legroom due to the absence of a seat in front. 12 F None No Power Seat 12 F is a standard Economy class seat that has extra legroom due to the absence of a seat in front. 25 B None No Power Seat 25 B is a standard Economy class seat that has limited recline due to the exit row behind. 25 C None No Power Seat 25 C is a standard Economy class seat that has limited recline due to the exit row behind. 25 D None No Power Seat 25 D is a standard Economy class seat that has limited recline due to the exit row behind. 25 E None No Power Seat 25 E is a standard Economy class seat that has limited recline due to the exit row behind. 26 A None No Power Seat 26 A is a standard Economy class seat that has extra legroom however, the protrusion of the exit door may be bothersome. This seat is missing a window. 26 B None No Power Seat 26 B is a standard Economy class seat that has extra legroom due to the exit. 26 C None No Power Seat 26 C is a standard Economy class seat that has extra legroom due to the exit. 26 D None No Power Seat 26 D is a standard Economy class seat that has extra legroom due to the exit. 26 E None No Power Seat 26 E is a standard Economy class seat that has extra legroom due to the exit. 26 F None No Power Seat 26 F is a standard Economy class seat that has extra legroom however, the protrusion of the exit door may be bothersome. This seat is missing a window. 37 A None No Power Seat 37 A is a standard Economy class seat in the last row of the plane. This seat may have limited to no recline and the close proximity to the lavatories may be bothersome. 37 B None No Power Seat 37 B is a standard Economy class seat in the last row of the plane. This seat may have limited to no recline and the close proximity to the lavatories may be bothersome. 37 C None No Power Seat 37 C is a standard Economy class seat in the last row of the plane. This seat may have limited to no recline and the close proximity to the lavatories may be bothersome. 37 D None No Power Seat 37 D is a standard Economy class seat however, the close proximity to the lavatories may be bothersome. 38 E None No Power Seat 38 E is a standard Economy class seat in the last row of the plane. This seat may have limited to no recline and the close proximity to the lavatories may be bothersome. 38 F None No Power Seat 38 F is a standard Economy class seat in the last row of the plane. This seat may have limited to no recline and the close proximity to the lavatories may be bothersome. Overhead TVs are located throughout the aircraft- with a variety of movies and/or short programs, depending on length of flight. 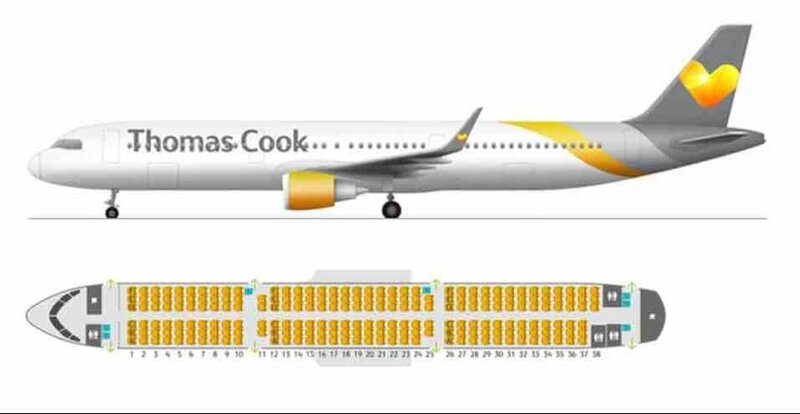 Thomas Cook Airlines flies their version of Airbus A321-200 in a one class configuration with 220 standard Economy Class seats. There was nothing wrong with these seats. Although the leg room isn't massive it was perfectly adequate and the reviews that say that the seats are 'disgraceful' or 'inadequate' are just plain wrong. Don't misunderstand, the seats are not the worlds most comfortable but they are fine for what you pay for. Economy class seats with enough leg room for all three of us without any problem whatsoever. We are all between 5'8" and 5'10" and we all found them to be OK. In 2019 for 4hr flight TFS > LGW the seating configuration on this plane G-TCDA was a disgrace! Sat in 10A, bolt upright and no legroom at all. The stowaway table couldn't fit flat! Awful plane, 3 toilets for over 200 people-chaos! The crew however were magnificent considering the confined workspace. Shame on you Thomas Cook! Never again. Dreadful flight. Seats small and narrow, no leg room and really uncomfortable. We had an older plane flying out and this newer one coming back. Both planes had the same small cramped seat layout. We fly regularly with all different airlines but we will never use Thomas Cook again. They don't even give you a choice of an upgrade seat. Crowded plane, seats so close together, little leg room. I am only 5'4'' yet my knees were up against the seat in front and my tray had no room to be fully opened. My husband's seat was broken! Quite the most uncomfortable flight I have even been on. Queues at Kos airport outside Terminal building, not enough seats inside either. I will avoid Thomas Cook Airines in future! We travelled home from Feurteventura on this A321 and it was the worst experience ever. a journey that was just over 4 hours long in a cramped uncomfortable seat. I have never stood for so long on a plane journey as I usually sit buckled up with my seat belt on! I cold not bare being in the seat. I am 5'11" tall so not exactly a giant and felt my legs pressed against the seat in front of me the whole time. The number of seats in this plane is only suitable for something bigger like an old 757 not a smaller airbus, Crew were ok but the seat and leg room horrific. Not going thru Thomas Cook again or this plane!! We travelled on a 321 on BA in June and was completely different. Better than expected seeing all the bad reviews made me hesitant, there is plenty of room for someone who is overweight as i have witnessed on the plane. Your average seat on a medium haul flight! I travelled with my wife to Egypt, which is around 5:30minutes flight. The 12F was my seat, it had nice window view, and of course extra legroom. But the 12D,12E had a bit more legroom than the other rows, and the 12D,12E are not charged as extra legroom seat, so it would be a good option for someone who wan't a bit more space. The 12B and C seats are the same. The food service only what we can complain a bit, we had pre ordered meals, but the cabin crew started to sell the snacks first, then collected the rubbish, and after these around 1.5-2hours later than take-off we could have our pre-ordered meals. That time we were very hungry as it was around 3pm when we got our food. The food was very delicious, James Martin meal, but the meat was so tiny, but we are not a big eaters, so it was fine, and you get biscuit, butter,cheese, bread roll and a dessert as well. So except the food service timing everything was fine. Worst legroom I have ever seen on an aircraft. Being 6' 4' picked an aisle seat and even then struggled to fit my legs in, which were digging into the seat in front! It Was a very uncomfortable ride. Great seats. I'm a BIG bloke at 6ft tall and 238lbs. Once in place these seats are ok. I have travelled by air to and from many places in over thirty years. Sometimes 2 or 3 places per week across Europe, Africa and to North America. 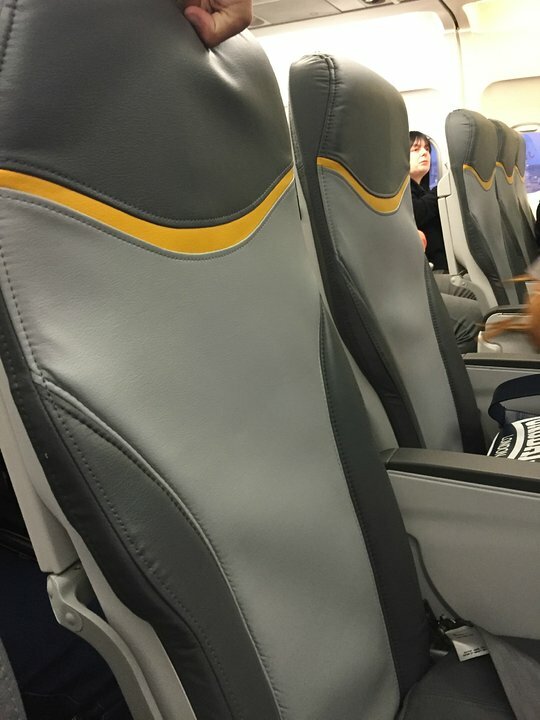 Comparatively speaking the Recaro seats on the Thomas Cook A-321 represent good value, with reasonable comfort at a great price. No complaints from me. I have flown on most airlines and aircraft types this is by far the worst experience I have had. packed in like sardines cartoons for in flight entertainment for a 4 hour flight NEVER AGAIN FLYER BEWARE !!!!! I agree totally with the previous review, the window seat on the way out to Gran Canaria had a fraction more leg room probably 29 but on the return journey I spent most of the journey standing. I have 34 inch legs and over 6ft 1inc and have never flown in such cramped conditions.Will not use TC economy again. When we boarded it was very clear that there was little room between rows. Despite the pitch being advertised as 28+ the measurement was nearer to 24". Very cramped and certainly not enough room for many of the passengers for the brace position had we have needed to. Very disappointed and we will not be flying Thomas Cook again. Hurghada to Manchester. Transportation of livestock in such cramped conditions has been banned yet Thomas Cook get away with it with passengers. Also, in flight entertainment was almost back to back 'Bugs Bunny' cartoons for 3-4 hours. Torture! Flying home from Cephalonia to Gatwick in seat 5D, 30 September 2017, between the front edge of the tray table and the back of my seat there was nearly enough room for me! Very restricted leg room. Sorry Thomas Cook, another future passenger lost! This seat has an increased recline amount and an excellent view from the window. Would recommend if you want a quiet flight! Whilst not extra legroom seats - these seats are the next best alternate. Since the cabin upgrade - legroom is on a par with easyjet/ryanair (you get what you pay for basically!) But whilst there is no window view - you can FULLY recline these seats without annoying anyone behind you. I would pick these seats again if the extra legroom options are already booked. Extra legroom seat, but opposite cabin crew, with no window, just a tiny porthole. Seat width encroached on by the exit hatch, so I wouldn't pay extra for this seat again. I found it very claustrophobic, and that's not something I normally suffer from. I'm 6ft tall and slim built. I had no room to stretch legs out etc. Spent the whole flight with my knees jammed into the seat in front. Luckily the return flight the seats behind were not occupied so could recline a bit. Still VERY cramped though. Had a flight earlier this year with easyJet and had more legroom. I think I will be missing TC for flights from now on. We travelled to Dalaman in Turkey from Stansted the outbound flight in Row 25 very comfortable and good leg room I am 6 foot tall and no skinny person. We pre ordered food for this flight that was tasty and hot nice meal. The return journey in Row 6 wow so cramped and we were the lucky two on that flight as we had 3 seats to ourselves OMG so uncomfortable unable to sleep. I need to add the cabin crew were absolutely brilliant on both flights a credit to Thomas Cook. A321 to Zante - booked Seats 26A (outbound) and 26F (inbound). Good legroom but be warned there is no window for these seats. I liked the sea, we could stretch out and we are both ober 5' 7"
The seats are very, very cramped. I had both knees pressed firmly against the seat in front of me the whole flight both ways Bristol to Corfu and back. I was unable to move my lower legs as advised re DVT and circulation problems (ankle and calf exercises). If there had been a call to adopt the brace position then that would have been completely out of the question!! I had to hold my in-flight meal as the table was not in/out adjustable so was pressing against my body and pitched up, so totally unusable. I will not be flying on a 321 again with Thomas Cook or any other airline. Passenger safety and comfort obviously mean nothing and it would be nice to be informed about the lack of space (seat dimensions) before booking. I found the flight on this aircraft quite pleasant. The food and entertainment was great, with also regular updates from the pilot. I flew from STN to DLM and it was great. New comfy seats and a new cabin design. I would definitely fly this airline/aircraft again, within a heartbeat. Having just travelled back from Tenerife to Bristol, this was the most claustrophobic experience ever on this length of flight. When the seat back table was lowered it was lodged into my body, I consider myself to be of average build, a larger person would have had real difficulties. I spent 4.5 hours with my legs jammed into the back of the seat in front. The hot meal took nearly 3 hours to be served. Profit over passenger safety and comfort is not acceptable. I will not be travelling with Thomas Cook Airlines again. These are extra legroom seats due to the positioning of the bulkhead. Three of us travelled, all normal height, and found the seats extremely comfy and very pleasantly surprised by the amount of room. The aircraft was brand new and had new deign seats. Perfect! The seats were really comfy and all the front row seats have extra legroom. However, they cost more to reserve. Hand luggage stowage is very limited. Crew were very helpful in finding somewhere to stow our bags, though. Best seats on the plane in my opinion. There is an overhead TV with good entertainment. Me and my family were in seats 21 A, B, C and D on a flight from Bristol to Larnaca. Service was good, kind crew, would reccomend. I'm 5ft7 & there was adequate room for the 2 + hours we sat en route to & from Ibiza. Tray down was a little tight but manageable as I'm a bigger lady. Seat comfort was ok for the time spent sitting on this trip. Not to far from nearest toilet & ques were no where near us. Good view from window.tv screen over seat in front so perfect. Thomas Cook Airlines flies 1 versions of Airbus A321-200.